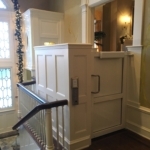 SEATTLE, Dec 2018 – Mobility Concepts recently installed a new Garaventa, Genesis, VPL at the historic Sunset Club in Seattle, WA. The Sunset Club’s history is deeply intertwined with Seattle’s own history, traditions and culture. The Sunset Club was founded in 1913 by women from some of Seattle’s most prominent families. Many were recent arrivals from the Northeast and Midwest who sought to replicate the elegance and culture of those more established areas of the country. The Club was formed to “promote social and intellectual welfare of its members.” It has accomplished this over the decades through luncheons, teas, balls, lectures, art performances and other events. 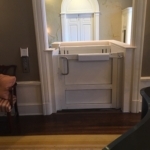 Mobility Concepts is proud to have installed this lift for the Sunset Club. 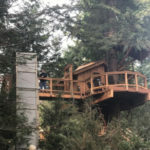 REDMOND, Sept 2018 – Microsoft has rigged up three high-tech treehouses for employees to work and meet in up in Redmond’s Pacific Northwest Douglas firs. The elaborate rooms were built by Pete Nelson, host of the TV show, Treehouse Masters. The treehouses are a part of Microsoft’s “outdoor districts” which are connected to buildings around the Redmond Campus. 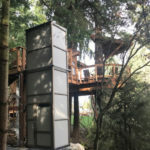 The company built the treehouses after a recent employee survey found many workers would like to work outdoors more if they could. 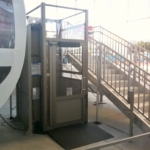 A Garaventa, Genesis, VPL, installed by Mobility Concepts, was included in the design allowing for two of the three treehouse to be accessible to all employees. SEATTLE, June 2016 – The Museum of Flight’s Aviation Pavilion is a covered, outside gallery with 15 rare and unique commercial and military airplanes. 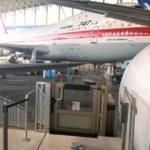 The Pavilion also offers the first-ever exhibit about the business of air freight. 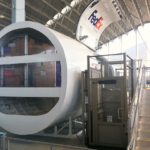 The FedEx Air Cargo exhibit, housed within a 34 ft. fuselage section of a former FedEx Boeing 727 freighter, is an interactive, behind-the-scenes exploration into the world of air deliveries. June 6, 2013 – In February 2011, the WA State Elevator program began working with the industry to raise awareness of the Maintenance Control Plan (MCP) requirement and to provide support in helping companies develop code compliant MCPs. The MCP, which is required under the current ASME A17.1 Safety Code for Elevators and Escalators, is designed to promote public safety by ensuring that conveyances are safe and the appropriate maintenance tasks, examinations and periodic safety tests are performed. 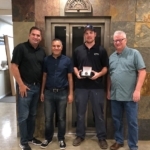 With one of the first approved MCP’s in Washington State, our customers can rest assured that we are providing them with the highest standards in safety and performance.